The spectacular Melbourne Magic Festival is back these Winter school holidays bigger and better than ever! Melbourne audiences can enjoy a stellar festival programme from June 27 to July 9 with over 300 awe-inspiring performances of 55 different shows, including free events and activities daily, plus interactive workshops and an exhibition! Since launching at Northcote Townhall in 2008, Melbourne Magic Festival has gone from strength to strength. Last year's event welcomed over 10,000 people with most events sold out! 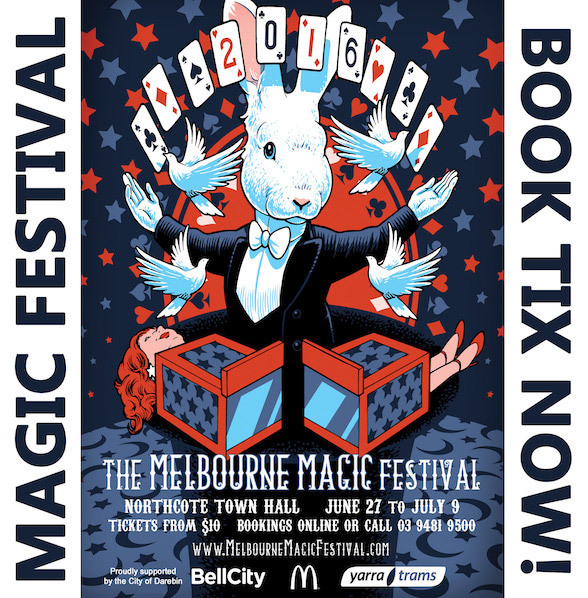 It is now officially recognised as the largest festival of its kind in the Southern Hemisphere and attracts magicians and magic fans from all over the country and beyond! This year, prepare to be amazed by a wonderful selection of acclaimed magicians, illusionists, mentalists, and other practitioners of stage magic. Highlights include international special guests John Archer from the UK, magic legend Max Maven direct from Hollywood, and over 60 exciting performers from all over Australia. Kids Shows such as Tim Credible's Family Magic Show; Make Your Parents Disappear… Again; Learn to Fly! With Domino; Once Upon a Rhyme and Mr B Pranks His Exam. Family Shows such as Magic Guy; Luigi Zucchini in Spaghetti Spaghetti; MMF Stage Gala Show; Why Kids are Smarter than Adults; Heavenly High Jinx; John Archer - A Magician and a Ukulele; Simon & Shoot & Davefunkel Backstage and many more. Adult Shows such as Deceptology; Dream Time; Nick Kay: Up Close and Personal; The Best of the Magic Show and many more. And after seeing someone levitate right in front of your eyes, being hypnotised and having your mind read, and witnessing a demonstration of astonishing sleight of hand, you may want to learn a trick or two yourself! If so, check out the interactive workshops on offer; Magic School with Tim Credible and The Magic School of Confidence. There's also great free events, activities and an exhibition to catch at Magic Central, the official festival hub, plus competitive events such as The Australian Junior Championships. The Melbourne Magic Festival casts its spell across the Northcote Town Hall this winter; be amazed as Melbourne becomes a magical hub for 13 days with incredible live shows for all ages and interests and great activities, workshops and more! You can view the complete event programme here. Tickets are now on sale for all events; click here to find out more details. For more information on the Melbourne Magic Festival, please visit the official website and Facebook profile.